It's MAY, my friends! And do you know what that means? For most of us, the end of the school year is in sight!! Now's the perfect time to wind down your year of Spanish learning with a field trip to your local Mexican(?) restaurant so that your students can practice their fabulous Spanish-speaking skills. Or maybe you are stocking up on materials to start Spanish lessons with your kids this summer. To help you prepare, here's a new download from MommyMaestra sponsor, Spanish for You! This month's printable focuses on a restaurant conversation. 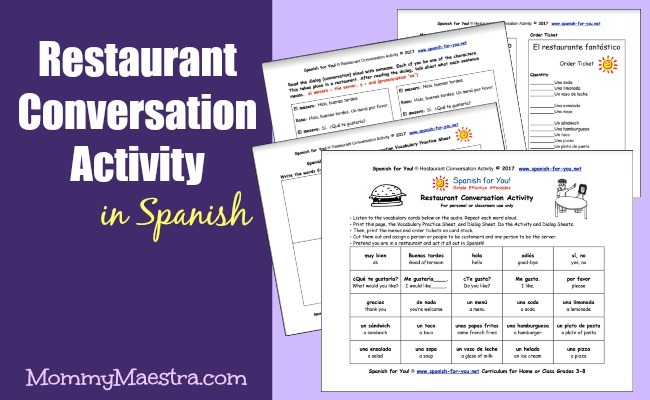 Your young Spanish learner will discover new vocabulary related to a restaurant visit with this fun activity. This printable 4-page activity comes with an audio file for learning proper pronunciation. The game includes vocabulary cards, a vocabulary practice sheet, a dialog sheet, and a menu and order ticket.